Summer’s finally here, and with two extremely energetic twin boys in the home, I’m obviously thinking about all of the trouble and harm they might get into. Say what you want about winter in the temperate zones, but at least it forces us indoors where things are *reasonably* safe. I say “reasonably” because we’ve had just as many traumatic injuries indoors as we have outside. It might be my imagination, but it seems like people are getting worse and worse at driving. Texting while driving, GPS systems, and general inattention are some of the reasons for this. We live on a non-through street and we still have people who zoom past the house in the middle of the day, going ten or fifteen miles per hour over the limit. This just drives me crazy. I want to go out there and yell at them to slow down, but I also don’t want to be that person in the neighborhood. Our driveway is the main concern — our kids like to ride their bikes and scooters up and down it. We’re always telling them to stay away from the street, and they usually obey, but it’s that one time that you have to worry about. 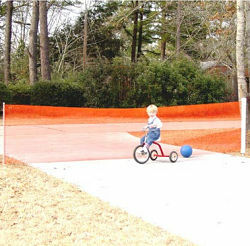 What I really want is the bright orange Kidcusion Driveway Guard which creates a visible, physical barrier between your kids and traffic. We recently took a vacation, and even though it was “up north” it demonstrated how strong the sun can be during summertime. Especially when you’re playing outside in the yard, at the pool, or on a beach. It seems like despite all of the technology that we’ve invented to protect ourselves from sunburns and ultraviolet radiation, lots of people (and their kids) are getting way too much of both. Sunburns are painful, torturous experiences for children. More worrisome is the UV exposure, which can cause mutations in the DNA and damage skin permanently. I’m a geneticist, trust me on this. Sometimes in the scramble to get 200 pounds of baby gear together, you’re going to forget the sunscreen. However, I think most of the time, it’s not a failure to use sunscreen, it’s a failure to use it enough. Our kids really don’t like waiting to put it on before going to play, and they don’t want to stop playing to get another coating of it, even when they’re due. Or they change outfits and suddenly have a bunch of new skin exposed. Honestly, what works best for us is the Neutrogena kids sunscreen, which sprays on via aerosol, is waterproof, and comes in 70 SPF. We keep two bottles in the van, so that we can find at least one of them. Even after coating them with sunscreen, you should probably minimize the direct sun exposure your kids are getting. A physical barrier that provides some shade is optimal, and it has the side benefit of keeping everyone a little bit cooler, too. A lot of areas — playgrounds, ball fields, beaches — simply don’t provide enough shade for families. So we like to bring our own, in the form of a little portable shelter like the Schylling Pop-up UV Shade. This thing is small and lightweight to carry, and goes up about two minutes. 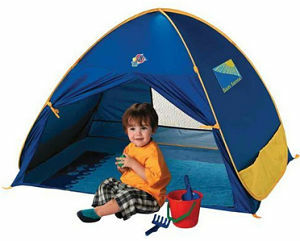 Your kid can sit in the comfort of shade and still play, but without the direct sun. As an added bonus, it also works to keep off the rain. It’s a fact that you and your toddler will probably spend some time around water. You might not be aware, but drowning is one of the most common causes of accidental death among children (in first world countries). According to the CDC, there are about ten deaths per day from drowning in the U.S., and two of those are children under 14 years of age. The most at-risk group for drowning is children aged 1-4. 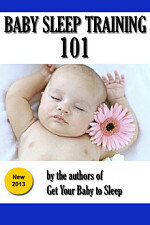 It causes 30% of deaths in that age group, the most common cause after birth defects. And where do most of those drownings happen? In home swimming pools. Those aren’t the only danger zones, though. In 2010, there were 672 boating-related deaths in the U.S., 72% were from drowning. And 88% of those victims weren’t wearing life jackets. We are very conscious of water safety, and I think that’s well justified after reading those statistics. Teaching them swimming skills. In other words, get them some swim lessons! You can start at about 12 months old and go all the way until your child is practically a fish. Learn CPR. It saves lives and also improves the outcomes of water-related injuries. Use life jackets. They’re required by law for children when boating, by the way. 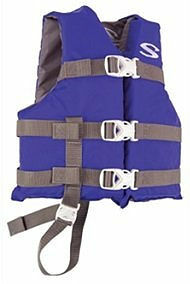 We have U.S. Coast Guard approved life jackets for all of our children. They wear them any time we’re around water: at the beach, lakeside, dock fishing, and even swimming in a pool. Not only do they help the child float, they’re also bright, which makes your child easy to see in the water (or in crowds), and they’re easy to grab. 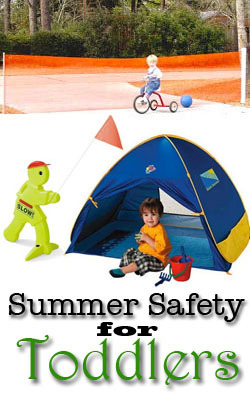 See this wonderful CDC Fact Sheet on Water Safety for some excellent tips. Humans might be at the theoretical top of the food chain, but that doesn’t mean that animals can’t harm us. Especially our little ones, who are basically defenseless and don’t know any better. We have a lot of wildlife in our neighborhood; probably the greatest concern is the white-tailed deer that frequent our yard. These are not shy animals, and though they’re generally going to run away if a child comes near, they are big. And fast. And sometimes they might have a fawn they’re trying to protect (something my neighbor’s dog found out the hard way). Another “animal” concern that’s statistically more likely to harm a child? 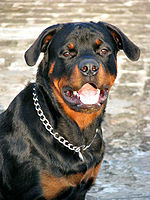 Pets, especially aggressive dog breeds like pit bulls, rottweilers, and dobermans. Before you dog-lovers take up arms against me, let me say that I’m a dog owner, too. I’ve been to the shelters. I know that some breeds get an undeserved reputation, and that both nurture and nature can affect a dog’s temperament. But we’re talking about protecting your toddler from other people’s pets. It’s common-sense stuff like close supervision at all times, and fencing the yard, and teaching your toddlers not to approach strange dogs. Even though we have a dog, and the kids are good with it, they know that they should not even go near another dog unless Mommy or Daddy says it’s OK. Letting your toddlers outside — even into the backyard — might put them in contact with some itch-inducing forms of wildlife. Mosquitos, ticks, and biting flies are doubly hazardous: they bite and cause irritation, and they can also carry serious diseases, like West Nile (mosquitos), Lyme disease, and Rocky Mountain Spotted Fever (ticks). Then, of course, we have toxic plants to worry about. Most notably, poison ivy. Parents should learn what this plant looks like, and keep everyone the heck away from it. This plant comes in many forms: it grows on the ground or on trees and fences. Its leaves might be rough or smooth. 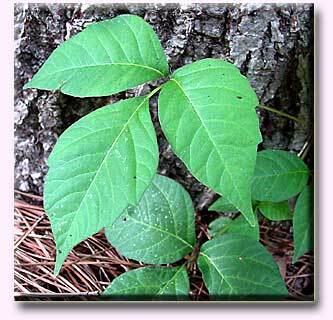 But the one reliable characteristic is that every plant has leaves in sets of three. If you can simply avoid it, you should. If it’s growing in your yard, however, it’s got to go. A diluted bleach solution will kill it (and almost any plant, by the way).